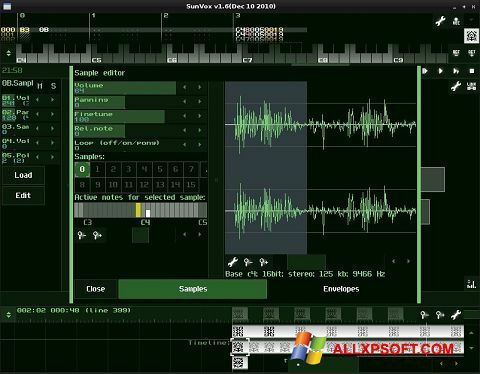 SunVox for Windows XP - sequencer with support for midi synthesizer. The editor uses the built-in library of samples and sound effects, supports 24, 32-bit wav and imports of third-party mod format elements, and is compatible with most modular synthesizers. The application uses its own synthesis algorithms, has a non-overloaded graphical interface, accepts VSTi plug-ins, allows you to export ready-made projects to popular digital audio formats. The program can work with analog inputs, can combine effects, contains a spectral analyzer and a frequency generator. You can free download SunVox official latest version for Windows XP in English.